What’s it like to have Narcolepsy? To feel exhausted no matter how much you sleep? This is Katie’s story of navigating life with Narcolepsy. My name is Katie G. Nelson and I’m a 28-year-old journalist, photographer and adventurer from Minneapolis, Minnesota. Before finding my purpose in storytelling, I worked as a humanitarian aid coordinator in Kenya while also dabbling in human rights activism in the United States. I also have a master’s degree in public health, which I promptly abandoned for a career in journalism. Currently, I’m a political reporter in the Land of 10,000 Lakes but am attempting to break into the international reporting field focusing on aid transparency issues in East Africa. I also have narcolepsy. More on that below. For those of us who don’t know, what is Narcolepsy? Narcolepsy is a chronic neurological disorder that causes the inability to regulate one’s sleep/wake cycle. About 200,000 Americans have narcolepsy making it as common as Parkinson’s disease or Multiple Sclerosis. * Extreme and unrelenting exhaustion that can’t be solved by more sleep; we’re constantly tired yet unable to get true, fulfilling rest. * Cataplexy: Sudden muscle weakness following a strong emotion such as sadness, surprise or fear. Cataplexy can range from a slight face droop to a complete collapse on the floor, all while being completely conscious. About 70 percent of people with Narcolepsy also have Cataplexy. I do not. * Sleep paralysis: an inability to talk or move before falling asleep or waking up, which creates a sensation of being trapped in your own body. * Hypnagogic hallucinations: vivid and oftentimes violent hallucinations before falling asleep or waking up. * Automatic behavior: performing normal behaviors (talking, eating, driving) but having no memory of such activities afterward. There is likely a genetic component to narcolepsy that, when coupled with an environmental trigger like an acute childhood illness, causes the neurological disorder. I should note that many people with narcolepsy, including myself, don’t suddenly fall asleep without warning. Rather, we’re always exhausted and never feel completely refreshed no matter how much sleep we get or how much medication we take. When did you realize that you weren’t just … really tired? I was initially skeptical about having Narcolepsy – thinking more it was congruent with a movie plotline than my 25-year-old self. But three years later, I can clearly see the trail of breadcrumbs pointing toward a sleep disorder, though it took many years of missteps before I got to the end. As a child, I was always the first to fall asleep at my girlfriend’s slumber parties, always becoming the designated guinea pig to a plethora of late-night hand-in-water tricks. In middle school, I was the last to finish in the annual one-mile running exam because I was just too tired to keep up with the pack. I attempted to salvage my reputation by pretending I was just too cool to run. Shortly before high school graduation, my sleepiness became so acute that I often escaped to a private restroom in-between classes to collapse in a stall and sleep for a few moments. But despite these hints and my marathon sleep sessions later in life, which at one point lasted 22 hours out of each day, it took over ten years to be diagnosed and treated for Narcolepsy. How does your diagnosis affect your life on a day-to-day basis? Medication management and a strict sleep regime determine my day-to-day success. 6am: I take a combination of three different stimulants, then wait until I’m awake enough to get out of bed (usually an hour later). 7am: I head to the kitchen and drink a small glass of orange juice, which helps my body absorb the medication faster. I brew my coffee (quickly) and head to the couch to sleep for another 30 minutes. 7:30am – 11am: This is my awake period when I’m most creative and able to process complex subjects. I try to do my heavy lifting during this time slot. 11am: I take another stimulant that will last me the rest of the day. 4pm: Find a place to take a short nap and clear my busy mind for 30 minutes. 9pm: I take sedative to sleep (many people with Narcolepsy don’t sleep well at night) as well as other medications to deal with the side effects of my stimulant medications. On the weekends, I sleep. Period. If I’m feeling well enough, I’ll go out one of the nights but always end-up feeling like a pile of old bones the next morning. What would your life look like if you WEREN’T on medication? What people don’t understand about Narcolepsy — and sleep disorders in general — is how sleep deprivation can impact someone’s mental health and emotional stability. Over the course of ten years, I was diagnosed with dozens of different medical conditions including depression and anxiety, which medications couldn’t seem to lift. I was profoundly and desperately depressed for many years and truly believed that my sadness, lethargy and detachment from the world were caused by some intangible and ever-present haze of despair. By the time I saw a neurologist, it was clear that I had a severe sleep disorder and he promise me that medication would help. He was right. Within one hour of starting my Narcolepsy treatment, I was an absolutely different person. I was awake, engaged and interested in the people around me – able of seeing a future outside of my bedroom and other than sleep. I literally got my life back. Obviously, it hasn’t been exactly a cakewalk since then. Some days my medications work well, some days they don’t at all. Sometimes I operate at 85 percent of my potential, sometimes at 40 percent. And on my really bad days, I sometimes grieve; ruminating over the moments I missed in the past and the ones I’ll miss in the future. Sometimes, I feel like everyone is living their lives around me and I’m still in bed, unable to move because my body aches with exhaustion. I can’t lie, those days are excruciating. I imagine one of the more challenging things about having a chronic disease is figuring out how/when to tell the people in your life about it. When you meet new friends, are on a date, or are starting a job – do you tell people? How long do you usually wait before you tell someone? When I was first diagnosed three years ago, people would always tell me, “Narcolepsy doesn’t define you” like I shouldn’t put so much weight into this condition, like it shouldn’t be such a significant part of my life. But I refuse to deny that Narcolepsy hasn’t shaped me. It has. That’s why I believe my diagnosis merits a conversation with the people around me, despite the social faux pas of discussing such things with friends, dates or peers. I’ve also chosen a career has flexible hours so I can work when I’m most sharp and awake the need to tell my employers is mostly a non-issue these days. How have the people in your life reacted to your diagnosis? Most people are inquisitive about my diagnoses, though some think I’m making an off-color joke about being really tired. I usually just deadpan those moments until people realize that I’m serious. What something you’ve learned from this that any of us could apply to our daily lives? I applaud people who say that their chronic illness has made them a better person or that they’re grateful for the experience but I am not one of those people. Narcolepsy has been the single most challenging and heartbreaking part of my life, and I wouldn’t wish this condition on anyone. That said, I am profoundly grateful for finding a concrete diagnosis and for the ability to access and afford my medication. That is a privilege I will always be thankful for. And as a final token of appreciation, I want to thank all of the caregivers, the well-wishers and the people who have backed me and patients like me over the years. Despite all of our cancelled plans, vague excuses to stay home and painfully sleepy encounters, you have stood alongside us. Thank you. Thanks so much for sharing your story, Katie. Do you guys have any questions for her? Have any of you struggled with something similar? P.S. For an interview about the other side of the coin: True Story: My insomnia affects every aspect of my life. I loved reading this! I was diagnosed at 24 or 25 and suddenly everything made sense. Hallucinations and sleep paralysis are my worst symptoms. I fully believed in ghosts growing up because I saw people and heard conversations all the time. I still get anxious when it's time to get ready for bed – going to sleep can be a crazy adventure though having my husband and dogs in the room gives me something real to, I guess, relate to. When I'm alone reality and the stuff in my head gets all mixed up. I actually HATED the meds I was given, so I reserve them for days when I have to be on top of things all day. Otherwise, copious amounts of coffee works well enough. I mostly don't talk about it anymore. People either expect a scene out of "My Own Private Idaho" (and cataplexy has only happened to me a few times ever) or they joke about how tired they are, too. No doubt, we are all tired, but I am crazy emotional, irrational, and irritable when I'm worn down. Luckily I've had very understanding roommates and a husband who know to just leave me be for a bit when I'm waking up – I can be a monster. I did not like my neurologist and my GPs over the years have just renewed my Rx as needed – I should maybe find a good sleep specialist and see what new options there are. Thanks so much for sharing! And for the opportunity to vent! This is an amazing story! I guess I never really knew much about narcolepsy, but it really does sound like an awful thing to deal with. Thanks so much for sharing your story with us! Many of us with Narcolepsy can relate to every bit of this. Thanks for sharing your story. It is nice knowing I (we) are not alone. I have been dealing with narcolepsy for 17 years now. It has not gotten easier, it just has a way of morphing into different stages that I have learned to cope with. Because of medication (and service dog) I can still drive. I do not drive for pleasure. To and from work. I dread the day I can no longer drive or work. Yup, loved reading this. People think they understand tired – they can't. I didn't get diagnosed until I was in my 40's. My mom always said I was lazy. I was never lucky (or smart) enough to have a job that let me work flexible hours, so you just muddle thru. I also don't have cataplexy, and I don't take anything to "help" me sleep … often I have horrible terrible violent nightmraes. My sleep doctor said it's common for narcoleptics to actually dream most of the time and nightmares are common. You don't get good sleep. Provigil "works" but it takes a long time to kick in – several HOURS, and if I take it after noon, the dreams are worse and I sleep REALLY fitfully. My doctors have warned that taking "three different stimulants" to wake up is fine at 25. Not so fine at 55. He used the words heart and explode in the same sentence. So i nap when I can and I thank God that it's narcolepsy and not Parkinson's or Multiple Sclerosis or cancer. Loved this article! 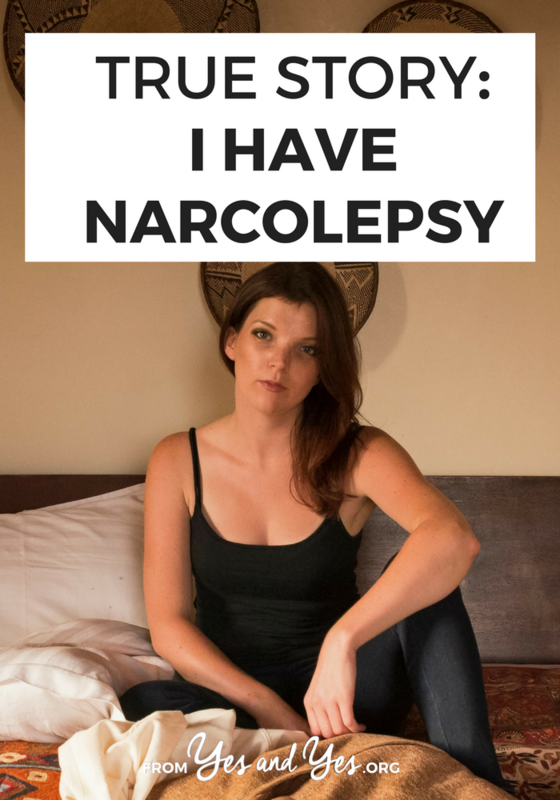 As a person with narcolepsy it can be frustrating when so much writing about narcolepsy it seems exaggerated or dismissive of certain aspects. In contrast, I think you did a great job of spanning the subject by discussing what her "average day" is like, as well as talking about the emotional impacts and process of adjusting to our condition long after initial diagnosis. I run a website (www.falling-asleep.com) with the intent of raising awareness and providing different types of information about narcolepsy, so I thank you for helping us to get the message out there 🙂 I'll be adding a link to this story in my "Media" section. What a wonderful clear, accurate explanation of Narcolepsy. I have had this condition for 56 years (diagnosed for 40yrs) and can relate to all you say. I especially appreciate the outline of your daily routine . I wish that I was as articulate as you when trying to explain my behavior and limitations to activities – so have made it so easier for me to do this. Katie, you are a fantastic Ambassador for support to people like us and to educate and raise awareness about Narcolepsy to the general public. Well done. Thank you to everyone who left comments and feedback about my interview. Though Narcolepsy isn't a cause that I've ever wanted to commandeer, I'm glad that my story has provided some perspective and understanding around the condition. To those who are living with Narcolepsy, I wish you all the best (including a good night's sleep)! I also have narcolepsy and for me, the worst symptom is cataplexy. I hate losing control on my body every time I am laughing or angry. I really liked to read this article, it explains so well the situation of a narcoleptic person. I loved this! Im only 18 now and it hit me in college when I really started struggling dealing with sleeping and schoolwork to get checked and sure enough I had narcolepsy. “It doesnt make things impossible for me, just harder” is a quote I kind of thought of to describe my life specially college life. I loved how you talked about people JOKE about me just being tired as if my condition is undermining and a lie. I also HATE when people try to relatea and say they might have it when its not something to claim if you really dont have the problems from it. I mentally struggle with it the same reasons as you. I feel like I really sleep my life away, and it saddens me. Im cranky, ill, and angry alot and I think its hard for people to realize that Im not trying to be like that so I end up hurting people, or etc. Im still young though so maybe/hopefully I will find better ways to cope with it and go on with it than how I have been. I was diagnosed almost two years ago, and you’ve beautifully articulated this experience in a way that I’ve struggled to do so. It’s hard to explain to others how Narcolepsy can be so isolating, and stories like these provide a level of support that we all need. Some of the things you mentioned here were as if they were plucked right from my own brain… sometimes being at 80%, sometimes being at 40%. Grieving on those bad days, and it being one of the most heartbreaking challenges of your life. Taylor – Thanks so much for reading my piece and for your kind words. I’m always striving to better explain the emotional, physical and mental effects of Narcolepsy but despite my best attempts, there are always aspects of this disease that are beyond description. I’m sure you can relate. I hope you are able to find your version of health and happiness, despite this disease. Keep advocating for the best care you can and know there are many of us fighting alongside you. Sending you warmth and love from Nairobi, Kenya. Wow! I’m so glad you chose the career you did because this is the absolute BEST real life explanation I have ever read of living life with this horrible disease. My 10yr old Son and 38yr old Husband were diagnosed with Type 1 Narcolepsy last year exactly one month apart from each other. I love the comment you made about other people saying that Narcolepsy doesn’t define you…it’s so very true that the effects of Narcolepsy (in a severe case) make almost every decision regarding your day for you. My boys have pretty bad cataplexy and although now medicated and finally learning how to somewhat navigate life after diagnosis, this disease still has so much control over my Family. We are now going through the process of attaining disability after losing every single asset we ever had. I’m now almost 40 and pregnant with our second child and my goal at this point is that by the time this new baby goes to school that we can get some accommodations in place as my sons school district has never had to dal with a child with Narcolepsy. Following their initial diagnosis, I had to deal with child services for 6 months because of the lack of education and understanding that so heavily surrounds this miserable disease. I appreciate the very candid and truthful description and think that people with more severe cases should speak as loud as they can to negate the “no big deal” attitude I have found to come from so many people that don’t have Narcolepsy. I wish you the best of luck and would love to hear from you anytime. I encourage you to think about writing some sort of book about your life with Narcolepsy. Even if that’s not completely in your wheelhouse, so to speak, I think that your article has been the most eye opening and spot on explanation of what so many people suffer from. Thank you again and I really hope for all the best for you and your loved ones.